Now the Interior Rear View Mirror and Flashing Auto Warning Light is definitely a mouthful, but this China-sourced invention aims to bring up road safety by another notch. Pai Lung Interior Rear View Mirror is light-weight with a compact size, it is easy to attach to the inner side of the car door and efficiently helps passengers or drivers observe traffic approaching from behind. 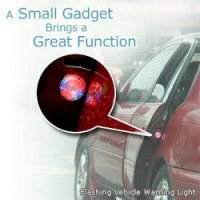 Moreover, its Flashing Auto Warning Light has a great indicator function; its bright light is able to get special attention from other car drivers, which ensures the highest security on the road. There is no word on pricing though, but with the company Pai Lung having achieved worldwide patent rights including U.S.A., Japan, EU and Taiwan, this should be able to be available in due time.